Inspired by the standout, colorful design of their monthly email newsletter, we got in touch with Bianca van der Ham, Editor in Chief at CityZapper, to find out more about what they do and how they use Mail Designer to create awesome emails. Travel experts, CityZapper, use their monthly email newsletter to bring their subscribers a taste of foreign travel and showcase some of the world’s most interesting cities and what they have to offer. All city guides and blog articles are also available for on the go in their iOS app. Thanks to Mail Designer’s creative tools, and an aptitude for outstanding design, CityZapper’s subscribers can enjoy a vibrant email newsletter packed full of useful information and genius, bitesize travel tips. CityZapper provides users with a huge catalogue of tips and suggestions for 100 cities across the world (with 30 cities in English), which they can then collect and add to their own personalized travel guide – delivered directly to them in PDF form. The team have made it their mission to provide explorers with inside travel tips and inspiring blog articles about the most beautiful sights, fun attractions, trendy nightlife, unique shopping, culinary highlights and more! 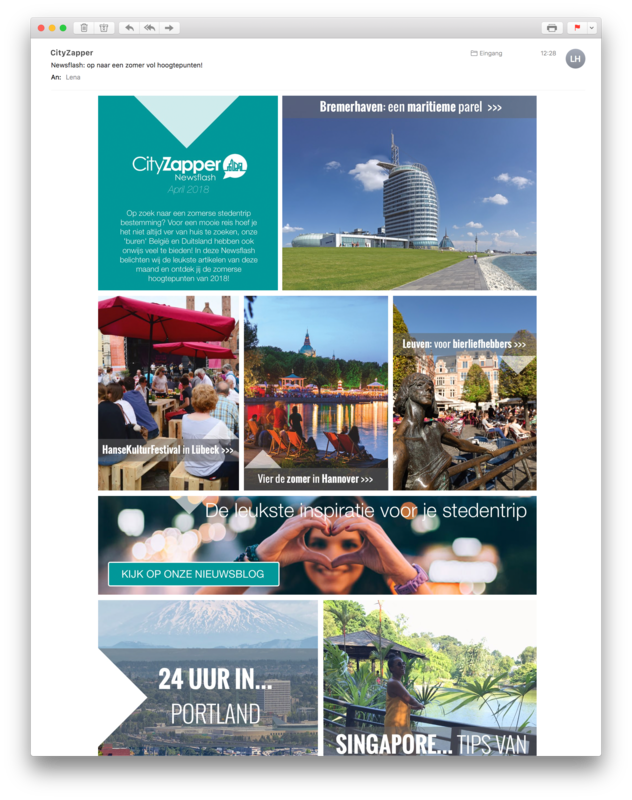 We interviewed Bianca van der Ham, Editor in Chief at CityZapper, to find out a bit more about the company’s experience with using Mail Designer. What differentiates your business from other competitors on the market? People can compose their own city guide on our website! They just need to pick the items they like and then a free pdf guide is created. This means they don’t have information they don’t need. Other than that, we have been operating for over 15 years, which means we are one of the leading and oldest websites in this field. How big of a role does your email newsletter play for your business? We send our Dutch subscribers a newsletter twice a month. We inform them about nice places to undertake a city break to and, in our Newsflash, we share our favorite stories from the past month. 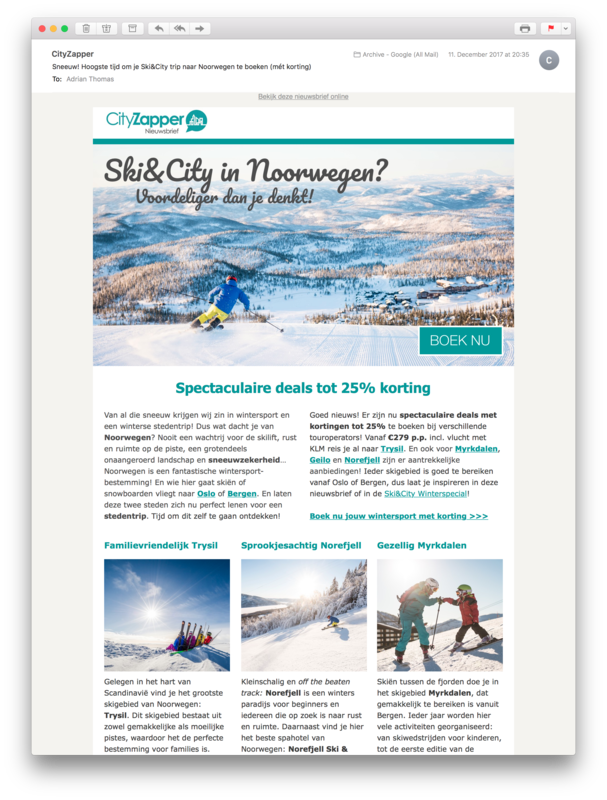 Together with our website and app, the newsletter is a great way to stay in touch with our customers! What was it that first inspired you to choose Mail Designer? My colleague saw an article about the application in a magazine about how easy it was to create stunning newsletters. That’s what we were looking for! What makes you prefer Mail Designer to other email design platforms? It’s easy to use and makes it possible to create beautiful newsletters. We also really like that it’s so easy to optimize for mobile devices. And the client support is very fast and accurate. It’s a pleasure working with Mail Designer! What advice would you give to businesses who are also looking to create a great email design? Purchase Mail Designer! It’s an easy and fun way to create mailings and newsletters. 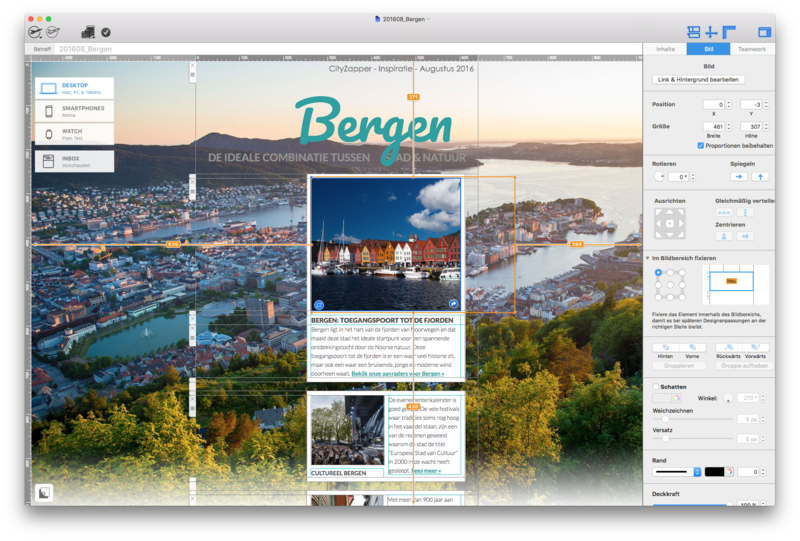 The example templates are very accessible and creative which helps you come up with nice new ideas as well.